Fall is my absolute favorite season of the year. The weather is finally beginning to cool off, we’re starting to see a few changes in the colors of the leaves (though here in central Florida, there’s really not many), and it’s almost Halloween. Life is good. And then there is the annual pumpkin invasion. Everything this time of year comes in pumpkin. Don’t get me wrong, I like pumpkin stuff, but after a week I’m ready to change things up a bit. 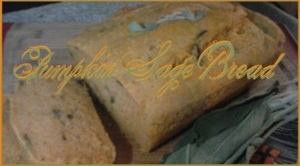 However, I really enjoy making bread, so I figured that I would share with you my favorite savory pumpkin bread recipe. Believe it or not, the “pumpkin” flavors that are popular in the fall are mainly just pumpkin pie spice, which is a mixture of cinnamon, allspice, nutmeg, and ginger. But pumpkin itself is a great powerhouse of healthful benefits. Not only is it high in fiber which is great for your heart and digestion, but it is also a great source of vitamin A which helps to boost your vision. Pumpkin is also packed full of antioxidants to help prevent cancer. In this recipe, I also used sage to help move away from the “pumpkin” flavors and bring out more of the actual flavor of the pumpkin. It is also one of the most commonly used herbs in my home. Sage (Salvia officinalis) has a long history of use as both a culinary herb and a medicinal. The ancient Egyptians used sage as a fertility herb, the ancient Greeks used it to clean ulcers and sores, and today it is still used for many of those purposes. Sage has a reputation for cleansing. I’ve been in many situations where people used a bunch of sage to “smudge” their home or themselves. Smudging is a traditional Native American method of purifying the air by burning a bunch of sacred herbs such as sage or cedar. Sage is also used internally to treat ulcers, sore throats, and coughs, to relieve indigestion, to reduce muscle tension, to strengthen the nervous system, improve memory, and sharpen the senses. Externally it is used to wash and cleanse wounds. It was also used as a hair dye to darken the hair. There are many many more benefits of sage, it is an extremely beneficial herb to use. Pumpkin is a great gourd that isn’t just useful to carve into a jack-o-lantern. Pumpkin is also great to bake with. 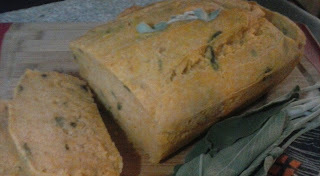 One of my favorite uses for pumpkin is in breads. I love pumpkin bread. I also love beer bread. They’re easy to make and easy to make gluten free. If you’re not on the gluten free bandwagon (as my friends like to call it), you can easily substitute your favorite all-purpose flour for the gluten free flour in my recipe. My favorite gluten free flour is by Namaste, but you can use whatever gluten free all-purpose flour you want. And if you prefer, you can use melted butter instead of coconut oil, or the beer of your choice instead of the apple cider I used here. Which, by the way, my favorite apple cider to drink and cook with is Angry Orchard, but you can use whatever cider you like. My general thought on cooking with alcohol is if you don’t like to drink a particular brand, why cook with it? Preheat your oven to 350 degrees F. Use ½ a tablespoon of coconut oil to grease a 5X9 loaf pan. In a large bowl whisk together the flour, sugar, baking powder, salt, and sage. 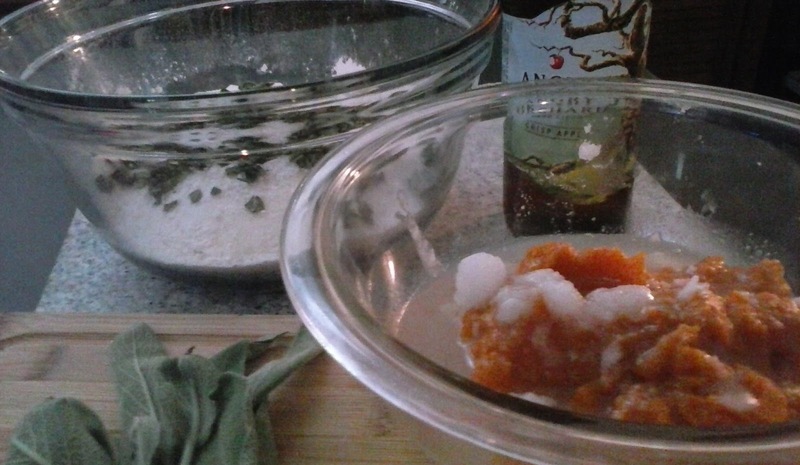 In another bowl, mix the pumpkin, coconut oil, and apple cider. 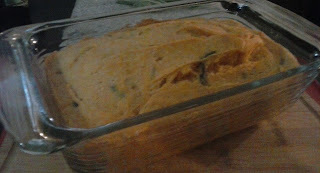 Mix the two sets of ingredients together and pour the mixture into the greased loaf pan. Spread the remaining ½ tablespoon of melted coconut oil on top of the mixture. Place in the oven and bake for 45-50 minutes, or until the top is golden brown and a toothpick, once inserted into the middle, comes out clean. I hope you all enjoy this recipe. Just like with all my recipes, feel free to play around and make it your own. Change up the herbs, use beer instead of cider (there are some really good gluten free beers out on the market right now), try it with honey, or add some cheese. Experiment and have fun making healthy bread for your friends and family!